2010. Published by the Appalachian Mountain Club. Edited by Steven D. Smith and Gene Daniell. 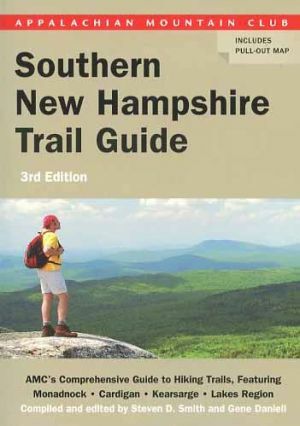 A brand new unread and unused heavily discounted copy of the third edition of this popular hiking guide to southern New Hampshire. Covers all the great hiking regions south of the White Mountains, including the Monadnock Region, Cardigan, Kearsarge, and the Lakes Region. Pull-out map features trails to Mounts Monadnock and Cardigan, plus Sunapee and Pillsbury State Parks. Softcover. 252 pp.